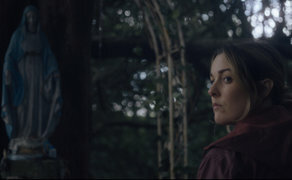 The first official trailer has been released for Michael Tully’s Gothic Horror ‘Don’t Leave Home’ starring Anna Margaret Hollyman, and Mark Lawrence. Written and directed by Michael Tully, ‘Don’t Leave Home’ is centred around a disturbing Irish urban legend that leads a young American gothic artist to Ireland. The film was shot in Ireland on the ground of Killadoon House in Celbridge, Co. Kildare. The film stars Irish actors Lalor Roddy (‘Michael Inside’, ‘Kissing Candice’), Mark Lawrence (‘A Girl From Mogadishu’, ‘The Secret Market’), David McSavage (‘Calvary’, ‘The Savage Eye’), Helena Bereen (‘Hunger’, ‘The Devil’s Doorway’), Karrie Cox (‘Tangerine’), and Anna Margaret Hollyman (‘Maude’, The Brave One’). After recently unveiling her new sculptural exhibit on Irish urban legends, artist Melanie Thomas (Anna Margaret Hollyman) is contacted by Father Alistair Burke (Lalor Roddy), a reclusive Irish priest who, legend has it, once painted the portrait of a young girl who later disappeared on the very day her image vanished from the painting. Now, summoned by Burke and his cohort to the Irish countryside for a special art commission, Melanie eagerly accepts the offer, never stopping to consider that some urban legends might be true. Being praised as “Get Out’ with Catholic guilt in the Irish countryside” (IndieWire), ‘Don’t Leave Home’ proves that not all mysteries should be solved. ‘Don’t Leave Home’ made its world premiere at SXSW back in March of this year, having filmed in Ireland between April – June, 2017. The horror has also screen at the horror-centric Overlook Film Festival, and Sarasota Film Festival, both located in the US. ‘Don’t Leave Home’ will make its Irish debut at the Galway Film Fleadh – Friday, July 13th.